Ef ég var spurð út í hesta þá stækkuðu augun, fóru að flökta og ég varð eins og bjáni. Gat þó sagt að þeir væru flottir, sterkir, og að mörgum finnist gaman að ríða út á þeim. Svo er folaldakjöt bæði bragðgott, ódýrt og mjúkt undir tönn (ég er ekki vegan - enn ;) ) Þetta var allt og sumt sem ég vissi. Lífið vildi þó skóla mig betur til og sendi mér óvænta gjöf upp á nánari kynni við þessar dásemdarverur. Mér var boðið í meðferð hjá virtum þjálfara og það í Kaliforníu. Vissi reyndar ekki nákvæmlega hvað í boðinu fólst en vissi að hún notaðist við hesta. Ég kunni ekki við að afþakka enda forvitin og lít svo á að hollt sé að vera opin fyrir nýrri reynslu. Reynslan var mögnuð og dæmi um hvernig draumar verða að veruleika þó þeir virðist óraunsæir í fyrstu. Ævintýrið byrjaði þannig að ég hafði nýlega lesið áhugaverða bók, Finding Your Way in a Wild New World, eftir höfund að nafni Martha Beck. Í einum kafla segir hún sögu um hestahvísl og hvernig hún sem elskar dýr er að læra að tengjast hestum án orða. Í frásögninni er hún stödd hjá þjálfaranum Koelle Simpson, sem kenndi henni tæknina að laða hesta til sín með því einu að slaka á huganum og tengja sig við sameiginlega vitund lifandi vera. Vá – þetta er eitthvað utan minnar getu, hugsaði ég á meðan ég las – en asskoti væri nú gaman að upplifa svona töfra. Ég er að segja dóttur minni frá þessari bók þegar ég fæ tölvupóst frá elsku mentornum mínum Lissu Rankin sem býr í Kaliforníu - og ég var einmitt á leið að heimsækja daginn eftir. Fyrir tilviljun (sem ekki er til) þá sendir hún mér tölvupóst þar sem hún segir dagskrá okkar vera opna. Diane Hunter vinkona hennar sem er meðferðaraðili og notast við hesta vilji bjóða mér (og tveimur öðrum skvísum) í fría meðferð. Ég sagði JÁ takk án þess að vita um hvað málið snerist. Átti ég að fara á bak – og það á risahesti? Hef sennilega tvisvar setið hest, samtals í um klukkutíma á ævi minni. En hvað um það – ég ætlaði ekki að vera skræfa. Ég lendi í Kaliforniu daginn eftir og var mjög spennt. Var það tilviljun að Diane Hunter hestahvíslarinn (á ensku kallast starfið ‘equine therapist’ og ég er ekki viss hvernig á að þýða rétt) lærði markþjálfun hjá Mörthu Beck og meðferð með hestum hjá Koelle Simpson, þeirri sömu og kenndi Mörthu Beck hestahvísl - í Afríku! SÖMU skvísum og ég las um í bókinni minni stuttu áður. Jæja, ég komst að þessari ‘tilviljun’ síðar sama dag og hef löngu lært að lífið er röð kraftaverka sem við sköpum með hugsunum okkar, orðum og gjörðum. SMILER gripurinn er einmitt til þess gerður að minna okkur á þennan sannleik og að þegar við sendum frá okkur jákvæðar og kærleiksríkar hugsanir þá gefur það okkur, já og öllum heiminum, meiri gleði, frið og gæfu. En áfram með söguna. Er við mætum á svæðið er ég umvafin þessum fallegu skepnum sem sýna bæði kærleik og forvitni þó ég kynni illa að lesa í hegðun þeirra - eins klár og ég nú er. Ég fór ekki á bak, en þetta var mögnuð sálfræðimeðferð þar sem ég lærði hvernig hestur ‘speglar’ mig, viðhorf mitt og hegðun mína gagnvart sjálfri mér og öðru fólki – já, svona í samskiptum yfirleitt. Hestarnir voru ekki sérþjálfaðir til að vinna sem meðferðaraðilar með fólki – en þvílíkir snillar! Ég varð orðlaus. Þeir skynjuðu nákvæmlega hvað ég þurfti að læra – og kenndu mér mikilvægustu lexíu lífsins; skilyrðislausa ást. Einn gæinn, Tommy Bahama, dansaði við mig, þ.e. tyllti höfuð sitt á herðar og háls á mér á meðan ég dansaði hálftryllt við ímyndaða tónlist,. . . lag eftir lag eftir lag. Hann elti mig á röndum sem yljaði mínu hjarta og rölti frá mér þegar honum hentaði (sem var sjaldan enda dauðskotinn í mér). Annar, Elron að nafni, sleikti endurtekið hægri handlegg minn sem er fremur aumur og viðkvæmur enda víraður eftir slæmt olnbogabrot. Ég var gáttuð og hreinlega grét af þakklæti. Ég hafði ekki beðið um neitt. Ég hló hissa, þegar vitni sögðu mér frá því að í hvert sinn sem Elron sleikti handlegg minn þá reis honum þetta líka risahold. Það var eins og hvíslað væri að mér; karlmenn finna til karlmennsku þegar þeir sýna konu óumbeðna umhyggju – svo lærðu að þiggja. YES! Góð lexía fyrir mig, þó sumum gæti þótt hún full gróf. Það gengur illa að stjórna hesti með frekju, fleðulátum eða tilætlunarsemi – þeir eru dásamlega ómeðvirkir, heiðarlegir og þeim er nákvæmlega sama um hvað þér finnst. Þeir forðast okkur þegar við erum ringluð í hausnum, með óskýr skilaboð og yfirgang, en leitast við að fylgja okkur þegar við erum slök og í góðum gír. Diane sagði okkur að hestar hefðu það hlutverk að heila plánetuna og vildu aldrei gera öðrum mein. Ég trúi því 1000 %! If someone asked me about horses, my eyes would get large and flickering, like a complete and utter moron. I could say if asked, that horses are awesome animals, very strong and a lot of people love riding them. Also that horsemeat tastes good, is cheap and tender, that was about all I knew (I’m not vegan – yet.) But life wanted to teach me something new and sent me a surprise gift so I could have the opportunity to get to know these wonderful creatures up close. I was offered to participate in a treatment by a famous therapist in California. I had no idea what the treatment was about but it had to do something with horses. I decided to be curious and open and to look at it as a new experience. This experience turned out to be fantastic and a good example in how dreams can become reality although it looks farfetched in the beginning. The fairytale started after reading a interesting book „Finding Your Way in a Wild New World“ by Martha Beck. In one of the chapters she tells a story about horse whispering (I’m though not sure if it’s called that) and how she as a devoted animal lover is learning how to connect with horses without words. 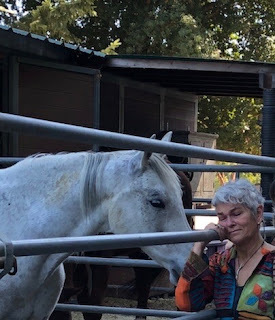 In the story she is with a coach, Koella Simpson, who thought her how to attract horses by simply relaxing the mind and connecting on a shared awareness level for all living beings. Wow – this is way beyond my capacity, I thought when reading about this in the book – and how great it could be to be able to experience this kind of magic. I‘m telling my daughter about this book when I received a mail from my dear mentor Dr. Lissa Rankin who lives in California – and it just so happened that I‘m on my way to visit her the very next day. 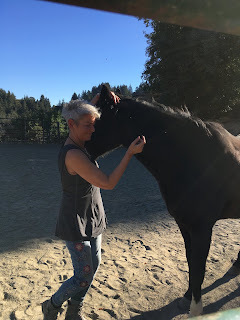 She is sending me a change in our schedule, were a friend of her‘s, Diane Hunter, a equine therapist, want‘s to invite me (and two other women) to participate in equine therapy with horses, free of charge! Is this a bare coincidence? (well there is no such thing in my opinions.) I immediately said YES, thank you very much, without knowing what I was getting myself into. Was I supposed to get on back of a horse – a huge one as well? I have probably only sat on a horse twice in my entire life, not for more that an hour in total. But no problem – I wasn‘t going to chicken out! I‘m in California the following day and I was very excited. 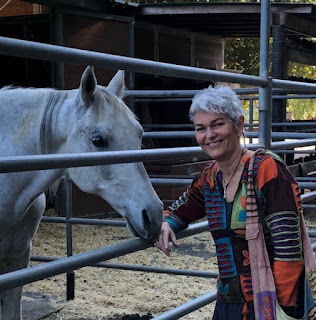 Was it a coincidence that Diane Hunter was trained by Martha Beck to become a personal coach AND also trained to become a equine therapist by Koelle Simpson, the same trainer that had helped Martha Beck to connect to horses in a mystic ways – all the way in Africa! The SAME LADY that I had read about shortly before all this happened! Well this coincidence (again there is no such thing) became clear to me that very same day and I have long since learned that life is a series of miracles that we create with our thoughts, words and actions. SMILER (the peace I created) is exactly made to remind us of this power we have and also to send out positive thoughts all around. But on with the story. When we arrive at the place I‘m surrounded with these beautiful animals that express both love and curiosity although I didn‘t know how to read into their behaviour at first - as clever I am. 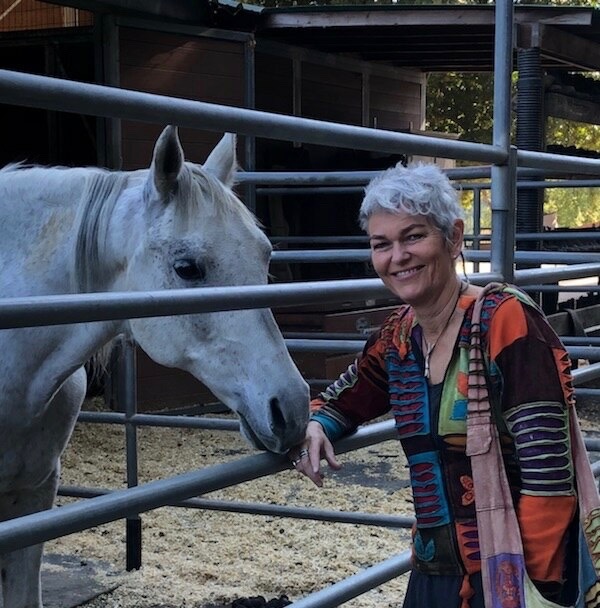 I didn‘t ride the horse, instead I went through a psychotherapy session were I learned how horses „mirror“ you, your attitude and behaviour towards yourself and others - our communication skills altogether. The horses aren‘t trained as therapists for people with special needs – but boy they were incredible! I was lost for words. They sensed exactly what I needed to learn – and thought me the most important lesson in this world; unconditional love. One of the guys, Tommy Bahama is his name, danced with me, that is he put his head on my shoulders and neck while I danced like a crazy woman to imaginary music,.... tune after tune. It was heartwarming to see him follow my every step and walk away from me when he felt like it (that was just for a short while, because he was really into me ;-) .) Another horse named Elron, licked my right arm repeatedly, the arm is very tender and sore after I injured myself recently and fractured my elbow very badly. I cried in true gratitude and amazement. I didn‘t ask for this! I was surprised to hear from eye witnesses and laughed when they told me that during Elron‘s licking session, the horse had a huge erection. It was like someone whispered to me; men get aroused when they give women spontaneous love –YES. A good lesson for me although some people would find it a bit vulgar. It‘s a bad idea to try to control a horse with force or aggressive behaviour – horses are, thanks to God, not codependent, they are very honest and don‘t care what you think or do. They stay away when we are confused, give mixed messages or show aggressive behaviour, but follow us when we are relaxed and in good spirit. Diane told us that horses are here on this planet to heal it and would never want to hurt anyone on purpose. I believe that 1000%.